A memory of Camp Fawcett from the 1980’s provided by Monty Gibson. Thanks Monty for sharing and we’re still laughing at some of your stories! Fawcett was a crucial piece of my formative years in Scouting, and will always have a special place in my memories and my heart. 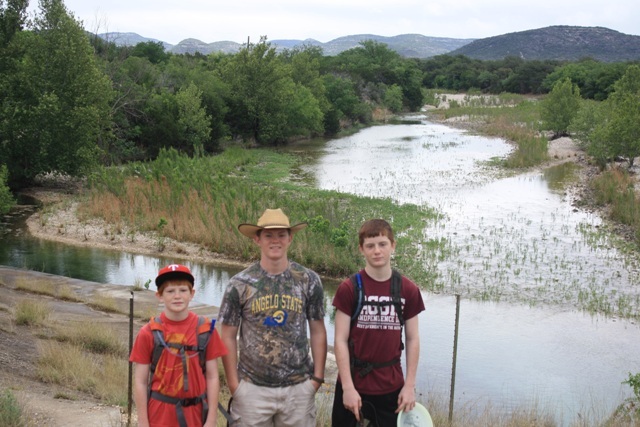 I had the opportunity to take my three sons (all in scouts: an Eagle, a Life Scout, and a Star Scout) to spend a weekend at Fawcett in May of 2014, before my oldest would leave home to attend college. We took picnic tables down to the Frontier campsite to help prepare for the Fawcett reunion that summer. I had the chance to show my boys all of the areas of camp that they had heard so many stories about. It was a great weekend for a former staffer and camper at Fawcett, as I know have memories of Camp Fawcett with my own sons as part of their scouting journey. My name is Monty Gibson. I grew up in San Angelo, Texas, where I did all my scouting. Earned my Arrow of Light from Pack 32, Eagle Scout from Troop 332, and was a member of Explorer post 23. I am currently Scoutmaster for Troop 1222 in College Station, TX and have three sons in scouting. Garrison (20yrs - Eagle), Chase (16 years - Life), Kyle (14 yrs - Star). I served as Lodge Chief for the Wahinkto Lodge #199 in 1987. I took my first Philmont trek in '85, Philmont Trail Crew in '87, and Philmont Staff in '89-'92 & '94. I've taken three high adventure treks as an Adult; Northern Tier '11, Philmont '13 (w/oldest son), Philmont '15 (w/second son), and planning for our next Philmont trek in a couple of years with my youngest son. I attended my first summer Camp at Fawcett back in 1983. Troop 332 camped in Campsite Bowie every year, and at 12 years old, Bowie felt like it was a hundred miles from everywhere! 1983 was one of the final years that Camp Fawcett hosted the camp wide "Capture the Flag" game. The entire camp would meet one evening during the week after chow and would be divided into two teams. One team had their "flag" up at Maddux Mound; the other team had their flag down by the waterfront. Each scout was given two "flour grenades" (flour bundled up in a paper towel, tied with twine at the corners). If you got hit with one, you were out and had to return to the flag pole. You could collect the leftover "grenades" from the scouts you knocked out of the game. Good game and lots of fun, but they discontinued it due to a scout getting hurt one of the other weeks of summer camp. Too bad, because we had a lot of fun! I remember taking Geology Merit Badge while there at Fawcett, taught by Ray Kedzora. We actually took a field trip to the road side cut outs on the highway through the devils backbone where Ray showed us Brachiopods (fossilized clams) that were in the limestone. Also found fossils of several worm tubes that were from marine invertebrate tube worms that formed the Coral reefs during the same time period. Ray also taught astronomy merit badge, and I remember looking through his telescopes up near the staff area. I remember first seeing the rings of Saturn there at Fawcett through those telescopes. I attended summer camp for three years at Fawcett, '83,'84,'86. (Troop took a Philmont Trek in '85) I worked on the Camp staff in '86 '87, '88. I worked in the Nature area - teaching Pioneering, Nature, Weather, Environmental Science, and Wilderness Survival. Working Staff at Fawcett and Sol Mayer was a big time for a young scout. Some of my finest memories on Staff include sitting at the square tables in the middle of the dining hall at Camp Fawcett and helping to lead songs at lunch and dinner, The campfire bowl - (Still one of the coolest outdoor amphitheaters around! ), Staff night (Tony Chambless made his famous turtle pie dessert) and we would sing "Rawhide" up in the staff area, Momma Sablan cooking for us in the dining hall (She always seemed to have some extra cake or cookies for staff members that stuck around to see if the kitchen staff needed help with anything). One of the neatest things about being on staff was that you were made to feel that you were unique and had something great to offer to the scouts coming to camp. Frank Hilton and Ray Kedzora did a super job of teaching young staff members how to deliver a quality scout program and be enthusiastic about our opportunity to teach others. At the end of staff training week each summer, Frank and Ray would present us with our Staff hat and Staff T-shirts. As they called you forward in front of your fellow staff members, Ray would hand us our hat and shirts, and Frank would always say something positive about the qualities and character of each and every staff member. That still sticks out in my mind. It was something special to be spoken of so positively by Adult leaders in front of your scout staff peers. It sure made you want to live up to their expectations as summer camp staff members! I complete my Ordeal for Order of the Arrow at Camp Fawcett. I was placed near a trail out near Maddux Mound to spend the night alone. I remember being woke up in the middle of the night by a white tail buck that must have been startled to find me there sleeping in the middle of the night. He snorted, which woke me up. When I sat up to see what made the noise, he ran off down the trail. I realized the next morning that I had decided to lay down right in the middle of a game trail, as there were lots of tracks on the trail, both old and new. The Medicine man marched around the circle, staring into the eyes of scouts and adults alike, as if he was looking to see who would be the first to run off in fear. The chief (Allowat Sakima) and the guide (Kichkinet) came out of the woods lead by torch light to join the medicine man inside the circle of scouts. The procession would then work around the circle of scouts, the medicine man chanting "Aaaaaaa-Yaahhh!" in a low guttural town. He walked in a crouch, looking each scout in the eye as he passed, shaking his gourd rattle as he went. The drum in the woods had started its slow, methodic beat again, adding to the intensity of the medicine man's glare. Then, seemingly out of nowhere, he would pounce into the face of a scout of advisor, screaming and shaking his rattle. The drum would strike rapid honor beats. Allowat Sakima would step forward to tap the OA candidate on the shoulder, with another Arrowman repeat the honor taps from behind. A wooden arrow on a twine lanyard was placed around the candidates neck and the Medicine Man placed a red mark on his forehead. The new candidate was then pushed backwards into the arms of two OA Arrowmen in their class A uniforms and white sash, and they ran with the candidate around the outside of the circle and then disappeared off into the darkness. After seeing the first candidate disappear, I remember praying that the medicine man would not scream and shake his rattle at me! It was seemingly random as these scouts and scouters were tapped out, as not a word was spoken. The medicine man just "knew" who to select. This was another long held secret in our lodge on how the medicine man knew how to pick out OA candidates from the hundred or so scouts at camp that week. Having had the chance to be the Medicine man at the call out in later years, I learned the secret, but I ain't telling!